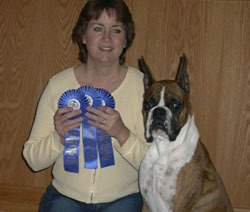 Angus posing with owner handler Doris Avery and judge Denise Cornelssen. 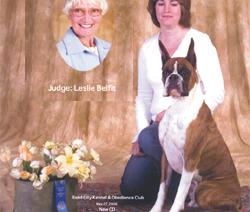 Titles: Canadian championship and PCD (Pre-Companion Dog) obedience titles in 2005. CD (Companion Dog) obedience title in 2006.
isn't a stuffed toy in our home that has survived his fury for more than 10 minutes. He enjoys dining on grass, pine cones, firewood, bugs, etc. earning another nickname "Hoover" (which he shares with his mother, Sawyer). Angus greets friends and family with a "WooooWoo" (hello) that makes everyone smile. Every morning is a new adventure for Angus – he's a real hoot to watch and to live with, and is the source of many, many stories! Angus’ show career . 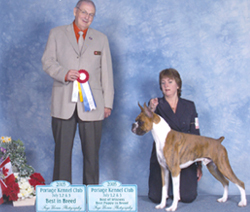 . .
On 04 March 2005 at the Prince Albert Dog Show, Angus entered his first dog show and from the 6 to 9 junior puppy class and won best puppy in breed and best of winners under judge Ingeborg James for 2 points towards his Canadian championship. 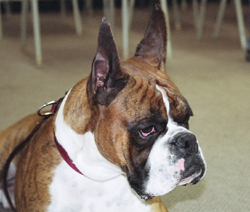 On 10 April 2005 at the Chautauqua Dog Show in North Battleford, Angus won best puppy in breed and best of winners under judge Patricia Miller for 2 more points. 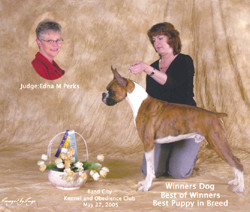 On 27 May 2005 at the Band City Kennel Club in Moose Jaw, Angus won puppy in breed and best of winners under judge Edna Perks for 3 points. 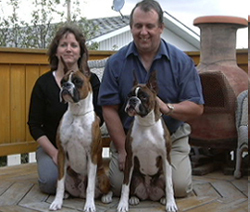 On 29 May 2004 at the Band City Kennel Club in Moose Jaw, Angus won two more points for winner's dog under judge Gerona MacCuaig. 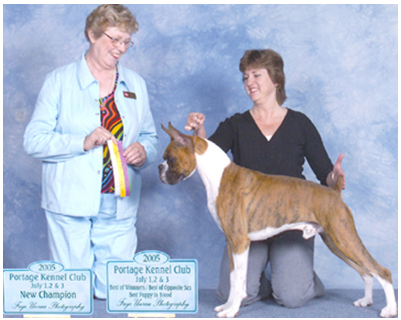 On 01 July 2005 at the Portage Kennel and Obedience Club in Portage, Manitoba, Angus won another point for best puppy in breed, best of winners, and best of opposite under judge Denise Cornelssen to become a Canadian Champion from the senior puppy class. 0n 03 July 2005 at the Portage Kennel and Obedience Club in Portage, Manitoba, Angus won another two points for best of breed, best of winners, winner's dog, and best puppy in breed junder judge John Kearley from the senior puppy class. 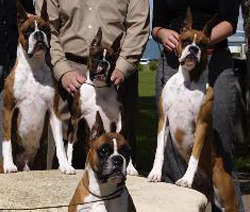 On 23 October 2005 at the Wascana Obedience Club in Regina, Angus qualified for his PCD (Pre-Companion Dog) title in three consecutive trials under judges Michael Calhoun and Gail Carroll. 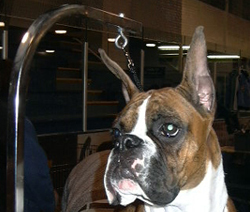 On 01 and 2 April 2006 at the Wascana Obedience Club in Regina, Angus obtained two qualifying scores towards his CD (Companion Dog) title under judge Lawrence Klassen. On the Saturday of the trial, Angus obtained a High in Class award and also won the club's award for being the youngest dog at the trial to earn a qualifying score! 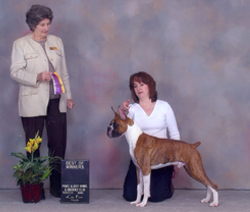 On 27 May 2006 at the Band City Kennel Club in Moose Jaw, Angus earned his third qualifying score for his CD title under judge Leslie Belfit. 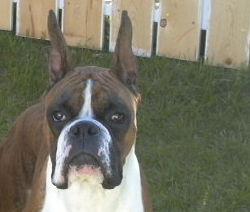 On 28 May 2006 at the Band City Kennel Club in Moose Jaw, Angus earned two more qualifying scores including a High In Class under judge Merlin Vandekinder. 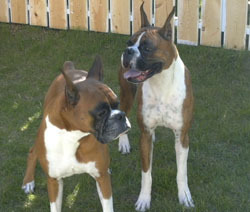 On 27 Aug 2006 at the Regina Kennel and Obedience Club in Regina, Angus earned his CGN (Canine Good Neighbour) title. Angus at various stages in his life . 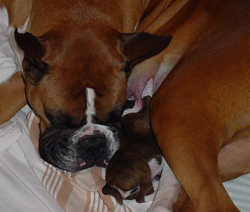 . .
Angus just a few days old with Sawyer. Angus snuggled with his sisters. 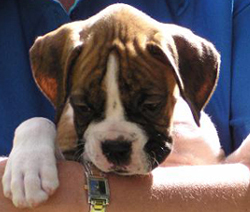 Angus being held by Dayna Avery. 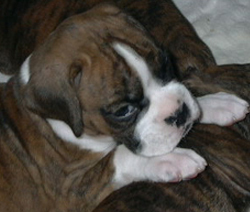 Headshot of Angus as a young puppy. Angus enjoying the outside with a brand new toy. 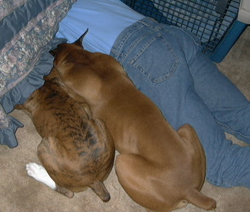 Best pal, Chevy, watching Angus with Dennis Avery. Bums galore . 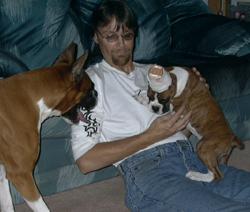 . . Angus, Chevy, and Dennis Avery. 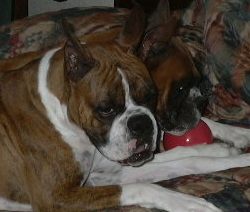 Angus and Chevy on the bed with a red ball. Angus & Doris Avery with Secret & Dave Gilmour. 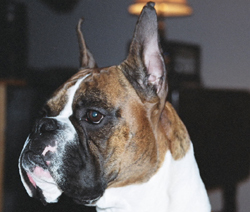 Headshot of Angus as an older puppy. Angus being groomed at his first dog show. Best of Winners for Angus under judge Inge James. A three point win for Angus under judge Edna Perks. Best of Breed for Angus under judge John Kearley. Chevy and Angus enjoying the backyard. 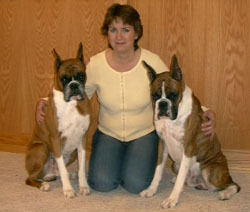 Chevy and Angus posing with Doris. Angus earns his pre-companion dog title with Doris. Angus practising his down stay. 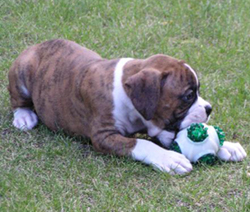 Angus earns his companion dog title with Doris. Angus posing for a headshot.